What Makes a Pasture Productive? Pasture rotation is also practiced in order to optimize plant growth and utilization by grazing vegetation at the proper heights and allowing for proper rest and regrowth. Activities such as brush hogging or clipping, dragging to break up manure clumps, fertilizing and over seeding are also necessary components of pasture forage management. Exercise or sacrifice areas are designated locations for feeding, watering, exercise and relaxation for times when pastures are not accessible due to lack of growth (winter or drought), flooding, etc. 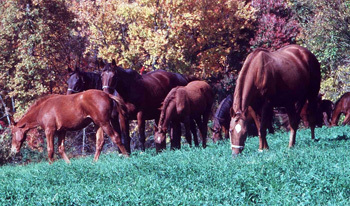 (see Exercise or Sacrifice Lots for Horses) Generally, these areas have little or no vegetation. It is important that manure not be spread in these areas. They are meant to be sacrificed for animal activities in order to protect the remaining pastures. Runoff from sacrifice areas should also be managed to reduce the risk of water pollution caused by sediment and nutrients from these areas. Erosion is a problem for several reasons. First, nutrients attach to soil particles. When they wash away, the Phosphorus causes algae blooms in freshwater. When that algae dies, oxygen in the water adheres to it, producing a lack of oxygen in the water for fish and other aquatic life. The sediment from erosion also covers nesting habitat for aquatic life and reduces visibility for desirable sport fish like walleye. Lastly, the runoff can contain bacteria from the manure that can be harmful to people downstream. Erosion problems on small farms are often different than large farms. On large farms, most erosion may be sheet or rill erosion running off large fields. On smaller farms, erosion may more often be a gully where animals cross a stream. Or it could be poorly vegetated pastures that provide poor ground cover during precipitation. Fencing, watering and feeding sites, presence or absence of field buffers, and stream crossings can all influence erosion on a small livestock farm.